Handmade wedding bands in certified 18k yellow Fairtrade Gold. The woman’s ring is a 1.8mm wide band with a delicate, hammered finish. 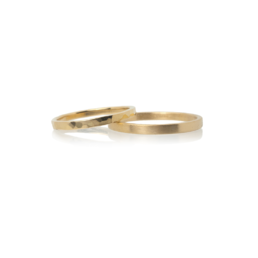 The man’s ring is a 2.5mm wide flat court wedding band with a matte finish. Rings can be handmade to a variety of profiles and finishes. Hand or laser engraving is available in a variety of fonts and styles.